What does my order status mean?,What does made-to-order mean? 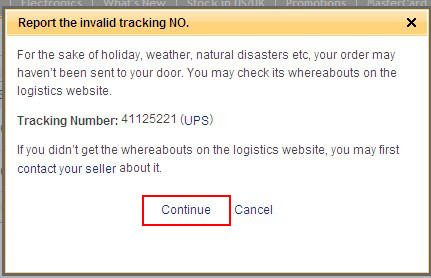 What should I do if the seller provides an invalid tracking number? Please contact the seller and ask him or her to contact the shipping company to obtain the tracking information; or you may contact the shipping company directly through their official website. If the seller does not respond, you may report this to DHgate as an invalid tracking number. We will then confirm whether it is an invalid order. Click Here to check the video. After the buyer reports an invalid tracking number, the tracking status will be shown as “Awaiting handling”. We’ll look into this as soon as possible to determine whether it is an invalid tracking number. Please be advised to go to your “Message History” to check for updates on our progress after 3 days. Once we have confirmed that the tracking number is invalid, DHgate shall request the seller to provide a correct tracking number with updated information in your Tracking Record. If the seller refuses to do so, then the seller’s account will be penalized by DHgate. 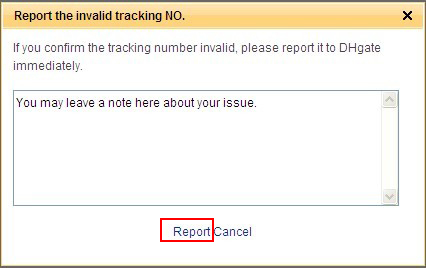 If the order is part of the Dispatch Pledge program, DHgate will confirm whether the tracking number is invalid or not. If cannot upload a valid tracking number at a specific time, our system will deduct US $30 from the seller’s account to compensate the customer. If the order is not part of the Dispatch Pledge program, DHgate will freeze the seller's account for 7 days. 4. The order is closed.